Truly an America playground, whether your interest lies in golf, the beach, or unending choices of attractions and dining options, Myrtle Beach offers it all. Spacious beachfront condos featuring amenities like pools, hot tubs, lazy rivers, kiddie pools, and more abound in Myrtle Beach. Drop your luggage, get settled in, and head for the sun and surf. Imagine building sandcastles with the kids, working on your tan, or just leisurely strolling along the surf as breakers crash against the shore. Maybe a dolphin-spotting cruise on the blue Atlantic is on your agenda, or you want a real challenge like deep sea diving for a shipwreck. Bring the rod and reel for great catches off a local pier, or goes boating, surfing, kayaking, SCUBA diving, parasailing or wind surfing. Whatever you want to do that involves water; you will find it in Myrtle Beach. Also known as a Seaside Golf Capital of the World, Myrtle Beach features more championship courses than any golf enthusiast could try out on a two week vacation. With lush greens designed by some of the top golf architects, you are sure to find a golf course that will become your favorite. Most condos have wireless Internet connections, so from the convenience of your living room, you can check out each golf course and get ready for the golfing vacation of a lifetime. The kids will go bananas at a beachside waterpark, squealing with delight as they plunge down the water flumes. Take them to the Ripley’s Aquarium or Waccamaw Zoo. They will also love the old school theme park with lots of thrill rides and an old fashion wooden roller coaster. Check out the museums, go horseback riding, rock climbing, experience the excitement of a helicopter ride, play miniature golf, ride go karts, or relax at the movies. Free activities include concerts, fireworks displays, and beach side evenings with street performers, jugglers, face painters, stilt walkers, and even inflatable jumping rooms. 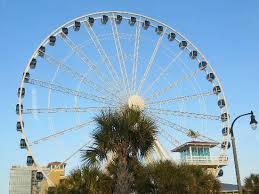 Myrtle Beach is never short on fun, and the kids will have a blast. For those in your group who like to ramp it up a notch, how about bungee jumping or a zip line? Or maybe you would like to experience the rush of driving a real NASCAR race car at Myrtle Beach Speedway. Of course there is shopping spelled with a capital S. While the golfers are at the golf course, the shop till you drop crowd will be blown away by the specialty shops, trendy boutiques, flea markets, antique shops, outlet malls, and the outrageous shopping complexes. Discover Market Common, an upscale life style center in a picturesque village setting featuring stores for the most discriminating tastes. Broadway at the Beach is an amazing shopping/entertainment complex built around a 23-acre lake, and Barefoot Landing, designed like a charming old fishing village, combines nature, dining, shopping and nightlife. Top all of this with music, theatre, and dining options for every taste at the hundred plus eateries on Restaurant Row; it all adds up to an unforgettable vacation in Myrtle Beach.